The LED Specialist recently produced an informative article regarding many myths and misconceptions about LED lighting. Now, it is going to explain how lighting has evolved and how relevant it has now become in creating the right ambiance and atmosphere in your client’s spaces. Bright white light that mimics daylight can improve performance for people at work. In addition to aiding people visually and helping them complete tasks that are otherwise impossible to complete without artificial light, the brightness and wavelength of ambient light can also impact the human circadian system, biological clock, mood, and alertness. Researchers have found that exposure to short wavelength or blue light during the day directly improves alertness and performance. Blue-enriched white light stimulates the brain, improves alertness, performance and sleep quality. The intensity and colour temperature of artificial lighting affects physiological processes in the human body, including blood pressure, heart rate variability, and core temperature. There is now a full range of LED office lighting including 600x600mm LED Panels, recessed LED downlights and surface mounted LED fittings. The most important thing to remember when choosing the correct office lighting centres upon the right colour temperature. For office lighting, The LED Specialist recommends a cool white (4000K) or a daylight (6500K) colour temperature. The cooler colour temperatures are best suitable for desk orientated offices, workshops, bathrooms or other areas where high detail visibility is important. Appropriate lighting in classrooms plays a key role to promote the visual comfort of students by facilitating their learning and concentration. Optometrists conducted vision and reading tests for children under three different colour temperatures and light levels. The researchers found that the children performed significantly better at 5000K than 3000K at the same light level, with the results being almost the same between the 3000K and low level 5000K groups. The optometrists observed that the pupils in the eyes of the children were more constricted at higher colour temperatures, which resulted in improved vision and higher alertness. The LED Specialist’s recommendation for lighting an educational application is a tunable white system which enables the lighting to be controlled so that it is variable and can be manipulated by the teacher in order to control the classroom. This enables the right colour temperature to be selected for the tasks that the pupils are undertaking. Simple pre-set options of 3000K, 4500K and 6500K would be ideal. The psychology of lighting also correlates to influencing consumer behaviour. Shops selling emotionally expressive products, such as jewels and engagement rings, will emphasise high illumination levels playing on the intensity of light to increase the intensity of the emotion. It is also important to determine how the different areas of a store should be illuminated. These include the facade, the entrance area, the shop window and the interior of the shop. It is essential to know where light is needed and for what purpose in the store: at sales points, over counters, at the check-out, in changing rooms, on mirrors, in relaxation areas, etc. The right light draws the customers’ attention and influences their buying patterns. Light emphasises products and highlights them in appealing colours. It presents the shop and creates a pleasant atmosphere. Modern sales-focused lighting presents products to their best advantage. The LED Specialist recommends LED lighting by a reputable brand which has a high colour rendering (CRI 90+). Inviting feel-good lighting in stores encourages the customers to stay longer. The LED Specialist has the following advice; when someone enters a venue, they should know within the first few seconds where to go and where to find what. “Orientation is essential.” Light can be used to guide guests around a venue by drawing their attention to different focal points or areas. Focal points are created through contrasts in brightness, often between accent lighting and ambient lighting. Ambient lighting can be used to diffuse surface-directed lighting. It can also make ceilings seem higher or walls wider. Next comes task lighting. These are fittings applied in areas where work needs to be carried out, such as the cash register or the kitchen. Installing a dimmer switch adds an element of flexibility, enabling the brightness of a venue to be adjusted to create different moods. Automated control systems can further aid the process, enabling different settings to be programmed according to the time of the day or year. Guests must always be able to read the menus and see their food and drinks. Getting the colour rendering index (CRI) wrong could mean that the visual impression of food (and drinks) doesn’t reach its full potential, having a strong impact on customer experience. Current trends are seeing a return to traditional approaches. Light sources are now open, with lampshades removed and cords hanging from the ceiling. Retro-feel light bulbs with an exposed filament are very popular, as it is the bulbs themselves that are the design feature. 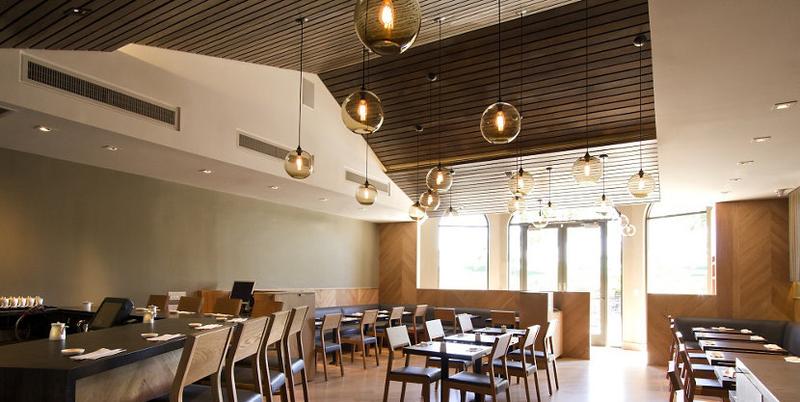 When it comes to non-decorative lighting, bars and restaurants are increasingly turning to LEDs in order to save money and reduce maintenance.